Located on a peninsula overlooking the Kazinga Channel on one side and the Rwenzori Mountains on the other, this recently renovated lodge provides some of the best accommodation and service facilities in Uganda. Amenities include a swimming pool, the Tembo bar and an elegant air-conditioned restaurant with global cuisine. Breakfast is served on the lodge’s outdoor terrace with views of the Kazinga Channel below. Set on the edge of a crater lake, Jacana Lodge blends in perfectly with the wooded surroundings of the Maramagambo Forest. Built using rock, wood, rope and other natural materials, each log cabin is beautifully and uniquely furnished and all rooms are en suite. A floating dining area on the Crater Lake provides a tranquil setting for sundowners and dinner in the evenings. 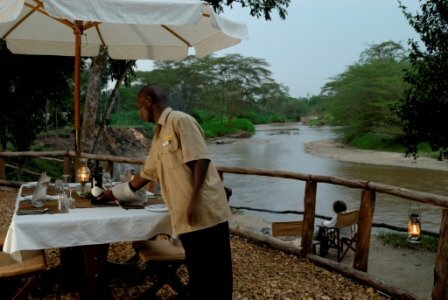 Ishasha Wilderness Camp is situated inside the southern Ishasha sector of Queen Elizabeth National Park on the Ntungwe river, and is an idyllic retreat for people who truly enjoy the wilderness. This exclusive camp offers quality accommodation and services in this unspoilt remote southern sector of Queen Elizabeth National Park famous for its tree climbing lions that can sometimes be spotted resting in the branches of the large fig trees in the area. Each of the ten spacious framed canvas rooms, situated in the wooded area besides the river, is comfortably furnished and with its own private en suite bathroom and dressing area providing running water,hot water ‘bush’ showers and a flushing eco friendly toilet. 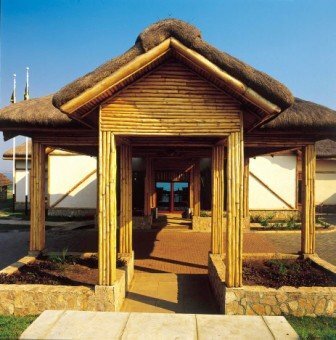 A central lounge / dining area, under a cool thatched roof, provides a comfortable environment for meals and relaxing during the day. A shaded area beside the river offers al fresco dining and an evening ‘fireplace’ for guests to relax with sundowners and share their day’s experience. Katara Lodge, just outside Queen Elizabeth National Park, provides a serene and exclusive luxury option overlooking the park’s vast landscape. Each of lodge’s large and spacious cottages has the option of a “sky bed” which can be wheeled to the cottage’s outside platform for a night under the stars. Katara’s restaurant and bar offer spectacular views. 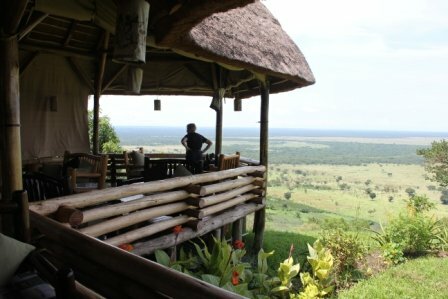 This lodge, located in the western part of the Rift Valley, boasts fantastic views of Queen Elizabeth National Park and the Rwenzori Mountains. Built using environmentally friendly local materials, the lodges en suite cottages are private and naturally situated among the native trees and shrubs, designed to be environmentally friendly. Kyambura’s restaurant has a cozy fireplace for chilly nights and guests can enjoy sundowners on the lodge’s deck overlooking the park. A private swimming pool adjacent to the lodge’s campfire provides the perfect setting for evening traditional dance performances. 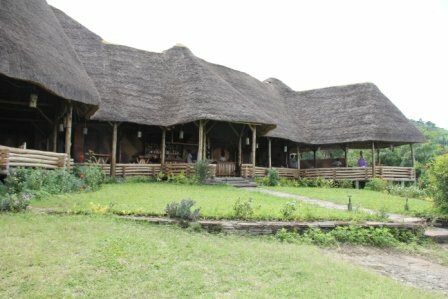 This mid range lodge is located on the outskirts of Queen Elizabeth National Park. It commands a spectacular view of Lake Edward and Kikoronko. 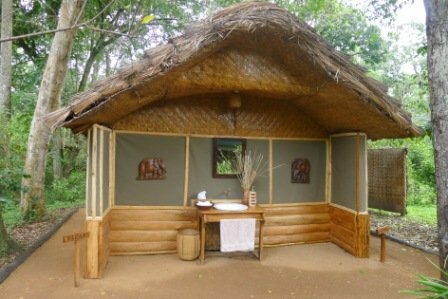 There are various accommodation types ranging from the en suite guest rooms to dormitories and camping facilities. Services are completed with dinning and bar facilities available on site. Situated on the edge of the Kyambura Gorge and Queen Elizabeth National Park, Kyambura Gorge Lodge, has far reaching views over the Gorge and the lush savannah of the park, with the peaks of the Rwenzori Mountains in the distance. The main lodge building was originally a coffee store and processing plant, surrounded by coffee plantations. The original structure has been sensitively restored to create a stunning living space, balancing the history of the building with the location and creating a series of distinct luxurious contemporary spaces for guests. Eight beautiful, spacious cottages have been carefully nestled into the hillside, each with their own luxury bathroom. 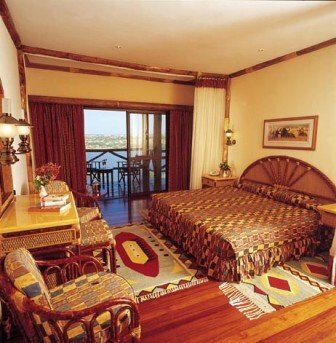 Each room has a different aspect of the panoramic views across the gorge, savannah and mythical Rwenzoris. Each room is uniquely appointed, adopting a different colour theme. This hotel is located in Kanungu district, not far from the Ishasha Sector of Queen Elizabeth National Park and may be a stop over when travelling to or from Bwindi National Park. Although not on the national power grid, regular power is provided, utilizing solar energy which is abundantly available in this area. It has a range of room types within the large grounds and a main building with a lounge with DSTV facility, conference hall, well stocked bar and restaurant where various local and international dishes are offered. Copyright © 2011 - Encounter Africa Safaris.